The weather in New York has been so balmy recently and since we're heading into prime citrus season in the Northern Hemisphere, it's no wonder that I recently wanted to create a bright, fresh and colorful salad. Here's a look at my "Pomelo Salad with Avocado, Pomegranate and Smoked Salmon". Doesn't it look like Spring? Alas, it is nearly December but it's been between 58˚ - 65˚F here for a few days now. I saw the gorgeous pomelo at my greenmarket and once I imagined the tart, slightly grapefruit flavor the wheels of creation started turning in my head. I picked up a few other ingredients, balancing tart with creamy, smoky with sweet. I know many of us are feeling a little plump after last week and this may continue for the next month, so please try this salad when you're needing to lighten things up a little in order to persevere through the holidays! 1 large pomelo, sliced and segmented into the "supremes"
I used the pomelo itself for the "bowl" in the photo at top. If you want to do it too, I sliced the pomelo in half, used a very sharp knife to cut around the edge between the pith and the fruit. I flipped the pomelo upside down and sliced off the rounded bottom to make it sit flat and reveal the pith. I sliced enough pith away that I almost exposed the flesh. Then, I pushed on the flesh from the bottom, which will pop the entire circle of flesh out the larger top half if your cuts around were deep and even enough. If this doesn't work you can also use your knife to peel away the skin and pith and then scoop the flesh out with a grapefruit spoon. A grapefruit spoon is one of my favorite kitchen tools, I use it to scrape out not only citrus but squash seeds, bread for making bread bowls and fibrous membranes of vegetables. After popping out the flesh of the pomelo, I segmented the sections into "supremes" by slicing between each segment to cut away the skin and pith. 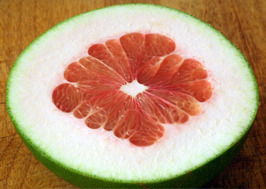 You should only eat the juicy, pearly segments of pomelo, the pith and skin is more bitter than grapefruit. Place the supremes into a medium bowl. Next, slice the avocado in half lengthwise with a large knife and then twist the halves in opposite directions to separate. Remove the pit by letting your knife drop onto the pit so it sticks and twisting the half-avocado. The pit should remain stuck to your knife leaving you two separate halves. Use a paring knife, gently hold the avocado in the palm of one hand to make cross-hatch patterns in the avocado flesh with your knife. The skin is still on in this technique, it saves you from peeling the avocado, which often makes it dented and mushy. Use a spoon to gently scrape the avocado away from its peel and add it into the bowl with the pomelo. Season with the kosher salt and black pepper and toss together. Crumble the smoked salmon in a bowl and squeeze 1/2 the lemon over the fish and mix lightly. Add the crème fraîche and toss. Combine the fish mixture with the pomelo-avocado mixture in the first bowl, add the chives and pomegranate seeds and mix very gently. In a small bowl, whisk together the olive oil, the other 1/2 lemon squeezed and pepper to taste. Pour this vinaigrette over your salad greens, toss gently. 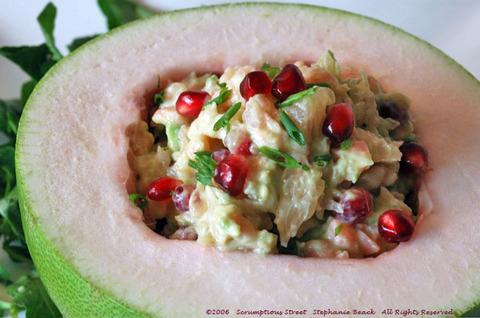 Place the greens on a salad plate and spoon the pomelo, avocado, fish and pomegranate salad on top or serve in the pomelo skin. Garnish with a couple more pomegranate seeds and chives and serve. We liked the smoked salmon, but it is a very strong flavor. It would be more delicate and lovely with smoked arctic char since its meat tastes like a cross between salmon and trout, or even creamy prosciutto. A while ago I was perusing one of my favorite blogs, Creampuffs in Venice, and saw that I missed a terrific blogger event thrown by Ivonne, Mary, Peabody and Kate. While I was too late to participate, I desperately wished I had joined in. Then I remembered it was impossible because I didn't own a food processor and the cheesecake and crust wouldn't work without one. In this season of holidays, gift-giving and fantastic baking and cooking, I thought, "WHAT?! Am I crazy? How could I NOT purchase one? Really, I have the space, I finally have the storage, I have the will, I have the inspiration." The next day, I bought my first-ever Cuisinart. It has changed my life. In less than a week. It arrived two days before Thanksgiving. I've been going to town ever since. Tears of joy speckled this creation, my decadent and very scrumptious variation on their theme from Tish Boyle's The Cake Book. 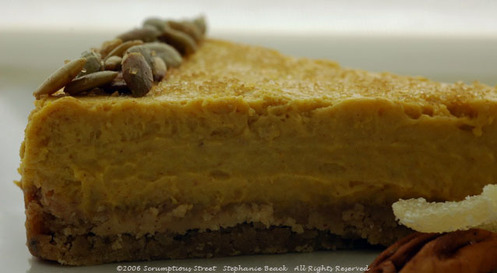 Here is my own "Kabocha Squash Cheesecake with Pecan-Ginger Crust." And, yes, I made my own squash purée instead of using canned pumpkin purée Why go for that tinny and metallic undertone when you can have moist, flavorful and fresh purée right out of your favorite new kitchen appliance? The other ladies went a lot further than I in their adornments and finishings, mine was no pastry art. But it was delicious and and exhibited such a creamy, light and moist texture as a result of applying the proper machinery to the task! For my purée, I started out by cutting a large kabocha squash in half, scooping out the seeds and putting a tablespoon of butter in each half and a little pinch of turbinado sugar. I had preheated my oven to 350˚ Farenheit. I then wrapped the cut side of each half of squash in aluminum foil and baked them on a half-sheet pan for about an hour. When they were tender, I removed them and let them cool enough to touch and peeled them with my very favorite knife. After peeling, I cut each half into rough hunks and tossed them into the food processor, ready to test my new machinery. It astounded me. Very quiet, rock solid (it didn't move on the countertop at all) and it made very quick work of the squash. I pureed each half in one round, surprised that it didn't take more batches. Ah, the beauty of 11-cup capacity!! Next, I strained a cup of the purée using a simple mesh strainer and kitchen spatula. I realized after doing this that straining was a residual effect of all my years of manual work with immersion blenders and drink blenders. Their shoddy results never left me a choice. The behavior was just ingrained in my technique. Truthfully, my food processor did such an amazing job on the squash, that I really didn't see a difference before and after sending it through the strainer. As you can see, very little pulp or fiber was left behind. The squash basically went straight through the strainer. My mind, only afterward, grasped with glee the fact that I may never have to do that sloppy technique again! Oh, Let's Give Thanks to Modern Kitchen Technology this year! And, my spacious pantry which enables its storage! Here's the rest of how the cheesecake came together, represented by my adaption of Tish Boyle's recipe. Position oven rack in the center and preheat oven to 350˚F. Lightly grease the bottom and sides of a 9x3-inch springform pan. Wrap the outside of the pan in heavy-duty aluminum foil to protect against leakage in the waterbath. Finely grind pecans and crystallized ginger in food processor. If you have a large processor, add flour, sugar and salt and process until combined; add the butter and pulse until the mixture forms coarse crumbs. Add the cold water slowly until the dough just comes together. Stop right away, don’t continue to process or you’ll overwork the dough. It should come out very soft, smooth, almost velvety. Use a spatula to scrape the dough into your prepared pan. Smooth and press the dough in an even layer in the bottom of pan. Bake for 25-30 minutes until the crust just starts to brown. Cool completely on a wire rack. Wash the bowl of the food processor for re-use. Reduce oven temperature to 325˚F. In a medium bowl, whisk together squash puree, heavy cream, vanilla, cinnamon, ginger, nutmeg, cloves, and salt. Set aside. Add the softened cream cheese to your food processor and pulse very gently 5 or 6 times with the dough attachment to cream it together. If you don’t have at least an 11-cup or 14-cup processor, you’d be better off using a stand mixer or hand mixer here because it nearly filled my bowl to capacity. Gradually add the sugars, scraping down the sides of the bowl as necessary, and pulse gently until well combined. 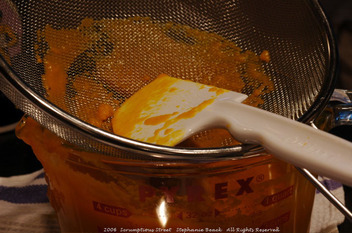 Blend in the squash mixture; add the cornstarch and pulse just until blended. Add the eggs, one at a time, pulsing after each addition, scraping down the sides of the bowl as necessary. Pour the filling into the cooled crust. Place the foiled springform pan in a large roasting pan or baking pan; carefully pour enough hot water into the large pan to come 1 inch up the sides. Bake for 70 to 80 minutes until the center is set but still a bit wobbly (the cake will set completely when chilled). Remove cheesecake from water bath to a cooling rack. Carefully remove the foil and run a thin knife tip around the edge of the cake to prevent cracking. Cool completely at room temperature. Refrigerate for at least 4 hours before serving. Set a small skillet on medium heat on the stovetop and wait for it to get hot. Add the raw pumpkin seeds and the olive oil. Toast the seeds, tossing frequently, until you see them go from their dark green raw hue (if hulled) to a light golden brown hue. Sprinkle the seeds with the turbinado sugar and cloves. Toss completely and remove from heat. Remove the cheesecake from the refrigerator no more than one hour before serving, and release and remove the springform pan. When the cheesecake is just shy of room temperature, slide it onto your serving platter and slice. Garnish with the toasted pumpkin seeds. Apparently the original recipe also calls for whipped cream or any other artistic flourish. Enjoy this absolutely warm, delicious, creamy, light and spicy treat. For all of our friends and family in the United States, we wish you a heartfelt Happy Thanksgiving! 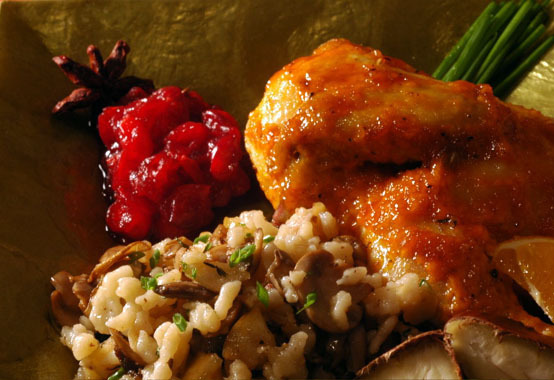 Mr. Scrumptious Cornish Game Hen, Mushroom and Chestnut Spaetzle and Cranberry Compote. We are extremely lucky to have a healthy life full of love, curiosity, exploration and passion. And, a kitchen with a dishwasher. Enjoy the Holiday weekend, everyone. My nose was cold. Really cold. And, I had to pull out the woolen scarf and gloves from their back-of-the-closet niche. My light coat was not quite warm enough and my usually fast walking pace clicked up to nearly a jog in order to keep warm. And there was a wide, beaming, splitting grin on my face. That snap in the air didn't yet end in tufts of white breath coming from my mouth but soon, very soon. And I love it. Why? SOUP! Yes, I do make soup all year long; light soup, chilled soup, stew, chili-soup, cream soup, thick rich soup, decadent soup and elegant soup. But this moment of the year, on the verge of moving into the hearty comfort soups and stews but still using fresh autumnal ingredients is really fun for me and my love of soup. Ever the experimenter I like challenging myself. I often start with a premise, like "soups with barley are bland" or "I like creamy soups better than broth-based soups" and then try to blow my own premise apart. It's so much fun. This is exactly what I did recently, when I was walking home, daring myself to create. And yes, these two particular premises are ones that I have voiced often enough. I made a barley and vegetable soup with a broth base and it ROCKED. Paraphrasing the words of my favorite author, "Contradictions do not exist. Whenever you think that you are facing a contradiction, check your premises..." It's so wonderful to create something that challenges my own opinions and challenges even meat-lovers' opinions of what can be scrumptious. Welcome to my "Barley and Vegetable Soup with Herbs and Lemon." Add the stock to a large saucepan and set on medium-high heat on stovetop. Add in the barley and bay leaf, if desired, bring to a low boil. Boil the barley about 40 minutes, until tender but slightly al dente like pasta. Add remaining ingredients except the lemon. Stir thoroughly and when the vegetables have all become tender and the barley is fully cooked, about 5-6 mintues, the soup is ready. Squeeze the juice of 1/2 a lemon over the soup and stir to incorporate. 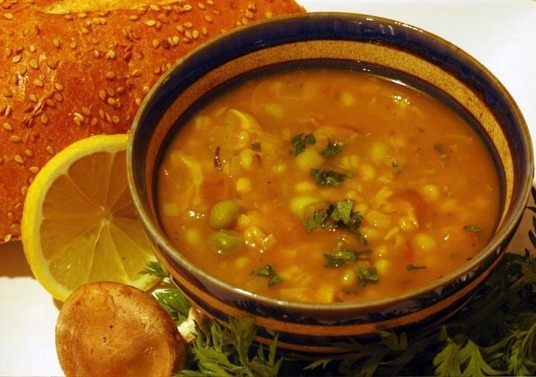 Remove from the stovetop and ladle the soup into bowls, garnish with fresh herbs and serve with hearty crusty bread. No matter what your work-life to home-life ratio, cooking during the week is not always the leisurely and relaxed exercise that it is during the weekend. We all work hard in the modern world and being able to make something scrumptious with less time on your mise en place and more time to “get things done” is tremendously valuable, daresay, often a relief. In this light, braising is such a terrific at-home cooking method because you usually can create a spectacular meal with no more than 15 minutes prep but enough cooking time to allow you to do that laundry, answer emails, write your presentation, book your flights, work on organizing your photos, shop online for gifts or wow…relax with a glass of wine in the bathtub while dinner is cooking itself. Ha! The most important aspects of braising are to make sure to brown your form of protein on very high heat before it goes in the oven, not to overcrowd the pan but give the meat plenty of room, (otherwise you’re steaming rather than braising) to use flavorful liquids and aromatics, to think like an architect building toward the final result as you go along, to cook it slowly and to keep the lid on the pot as much as possible until you’re ready to concentrate the flavors into finishing with a sauce. Thus, in the spirit of a weeknight that was crazy-busy but a heart that didn’t want to sacrifice a good home-cooked meal with Mr. Scrumptious, emerged my “Chicken Braised with Red Wine, Tomatoes and Anchovy”. Bring a small saucepan of water to boil on stovetop. Prepare a bowl of icewater for an ice bath. Wash tomatoes, slice off the small top near the stem and discard. 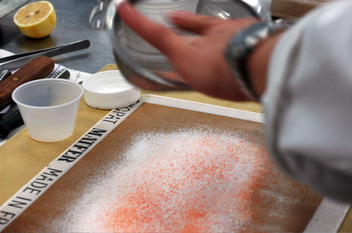 Score the skin very lightly from top to bottom into four sections with a very sharp paring knife, only cutting the skin. Put the tomatoes in boiling water and blanch for about 3-5 minutes until the skin starts to peel off the tomatoes. Remove tomatoes and slide them into the ice bath. When cooled, you can easily peel the skin off with the back of your paring knife. Cut the tomatoes into quarters, and squeeze out the seeds and extra juice and reserve for another purpose. You only use the flesh of the tomatoes in this recipe. Set tomatoes aside. Mix the minced garlic, rosemary and anchovy paste in a small bixing bowl. Cream them together into a smooth paste. Pour in the chicken broth and whisk together until ingredients are evenly combined into the liquid. Set aside. Season the chicken thighs with the kosher salt and pepper. Add the oil to a skillet on high heat and when the oil is hot, add the chicken thighs, skin-side down. Sear for about 5 minutes, until they show a deep golden brown color. Turn thighs over and sear another 3-4 minutes on the second side. Remove the chicken from the pan and set aside. Pour the extra fat out of the pan. Reduce the flame to medium and return the pan to the stovetop. Add the wine and chicken broth mixture and stir well. Return the chicken thighs to the pan and add the tomatoes. Cover the pan and place it in the oven to braise, for about 45-50 minutes or until the meat begins falling off the bone when you test with a fork. When the chicken is finished, remove the pan from the oven and take the chicken out of the skillet. Cover the thighs with foil lightly to retain their heat. Turn the stovetop to high and reduce the juices in the skillet into a thick and rich sauce by cooking on high, about 5 mintues. Add the red wine vinegar, season to taste with pepper. 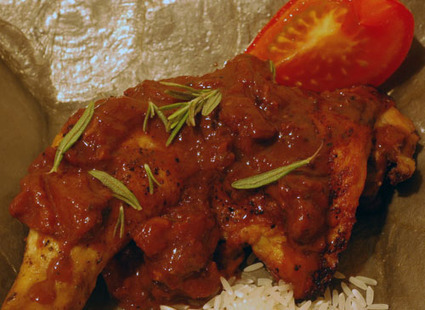 Put the chicken thighs on your plate and spoon the thick sauce over the thighs. Garnish with fresh rosemary and serve. What do you get when you combine a city that's a gastronomic hub, a top-notch culinary school, a 2002 James Beard award-winning chef who is the Executive Pastry Chef at a 3-Michelin star restaurant and 6 hours with 10 like-minded food professionals or food-addicted amateurs? 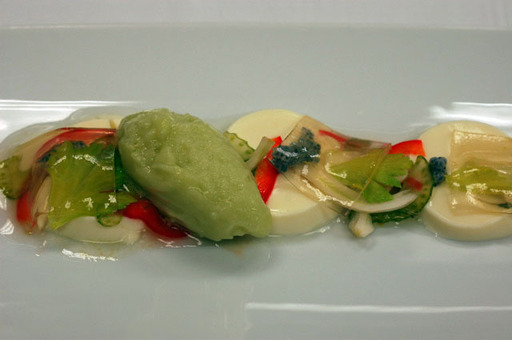 The "Plated Desserts Featuring Fall Vegetables" taught by Executive Pastry Chef at Le Bernadin, Michael Laiskonis. Last weekend I had the tremendous honor and joy of attending just this class. It was an incredible experience and I will remember the evening for a long time. The class was officially closed, meaning it was by invitation only and almost all the other 9 students were already "in the business". My dear friend just completed culinary school and my entrance in the class was a birthday gift. What a gift indeed! 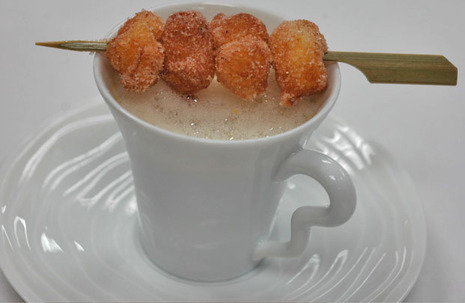 One of the fascinating aspects of Chef Laiskonis' technique is he has perfected the concept of sweet and savory without overwhelming either one. 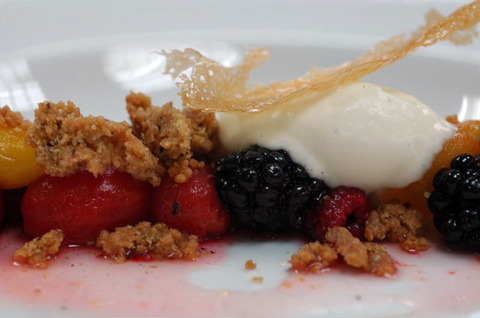 The desserts celebrated those ingredients we're all using this time of year, but the kind of inspiration he showcased is absolutely one aspect that elevates the top of the field professional from the enthusiastic and dedicated amateur. Let's move on to the dishes and the photos -- I know you're as anxious to see them as I was when I first flipped through the recipes in our course handout. Fantastic, right? I can't imagine anyone reading this post and seeing those photos not drooling all over the keyboard and wanting to lick the screen. YES, they were all MAGNIFICENT and incredible, eye-closing-and-moaning delicious! I'd been to several classes at ICE before and the way Chef Laiskonis taught this really was terrific. 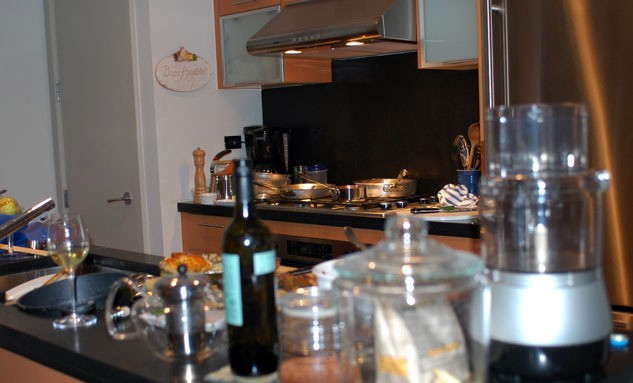 Usually, the instructors would divide the class into groups and have each group make a complete recipe or dish and all its components together. 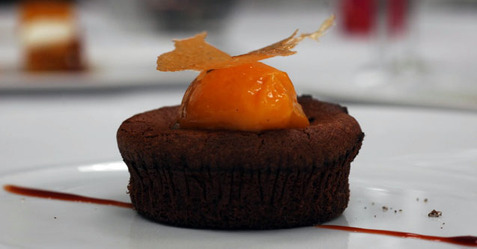 Chef Laiskonis, however, divided the group of 10 into four small groups and had each group prepare four different components from four different desserts. This was a wonderful strategy because it exposed all of us to at least four different techniques, methods and dishes. In this way, I learned so much more than usual. He was a very talented teacher because he really focused on conveying knowledge and personal insight. When we first broke into groups he circulated to every team and laid out the order in which to prepare each of the components and also asked each group to pause at certain recipes or preparations because he wanted to then show the entire class that technique or dish. Another thing that was terrific is rather than having us gather each component and put it together, he had planned it so that every component of each dessert was ready at the same time and then we ended the hands-on and he went back into demonstration mode. He took every separate component of each dessert and explained the rationale, pairing and taught additional insight into each dish. He plated all of them for us, and it was inspiring and fascinating to me (someone who's never worked in a professional kitchen) to see this first hand. As he plated, he'd introduce a new technique or concept for the finishing touches. A gorgeous example of this is the basil seeds that he'd bloomed in water and lemon juice. This photo shows the result. They looked like some kind of tapioca or caviar and several of us were trying to figure out what they were before he used and explained them. 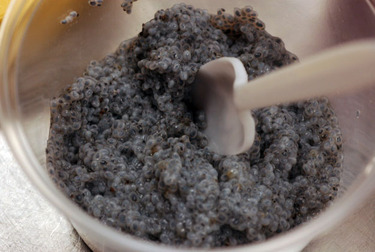 They were delicate, with barely any flavor at all but the texture fooled you into thinking it was an odd kind of caviar. He used them to put the finishing touches on the Panna Cotta dessert. In case you're curious, my team did the Verbena Scented Tomatoes, the cinnamon beignets that accompanied the squash soup, the apple-celery sorbet for the Yougurt Panna Cotta and the red wine caramel for the Warm Chocolate Cake. The way chef interacted with each team during the preparation was so valuable and informative. For example, the timing and preparation of the red wine caramel is very precise so he came over to show us exactly the deep, garnet hue he was aiming for. He told us how to add the sugar slowly to the pan of water so that it didn't splash up on the side of the pan and later crystallize into chunks of sugar. He taught us not to use any kind of utensil but to swirl the pan, so that there weren't globs of caramel forming in the pan or stuck to a whisk. He taught the art of test for "doneness" with the caramel: spoon it gently onto a plate and let it cool to room temperature. It should be silky-smooth and thick and creamy, not stringy or paste-like, of course. The insight and inspiration were in the details. The methods, the ingredients, learning the difference between various sugars, glucose, isomalt, sorbet and ice cream stabilizers; never have I learned so much in 6 packed hours. I am someone that consistently is disappointed in classes of formal instruction. This was the FIRST exception and it was tremendous how much I learned from him, and this excellent teaching strategy. This class with Chef Laiskonis was simply spectacular. It's still butternut squash season here at Scrumptious Street and I did another variation on the theme, this time making a Butternut Squash Risotto. Experimenting with techniques from one region and spices from another, in non-traditional ways, is such a blast. I do it all the time. Danielle over at Habeas Brulee is running a challenge this month for "The Spice is Right VII: Frankenstein's Monster". The point of the event is to "Try using a spice (or blend of spices) with a technique or dish from a cuisine that typically never uses that spice (or blend)." Of course, I'm game! 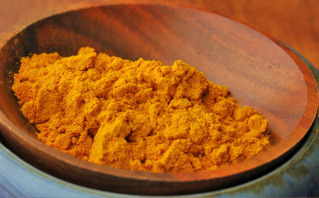 My Frankenstein's Monster spice highlighted in this recipe is turmeric. Turmeric is a spice often used in curries and South Asian cooking. Its scientific name is Curcuma longa, also called tumeric or kunyit in some Asian countries. The flavor is light and smoky, a hint of spiciness but not hot. 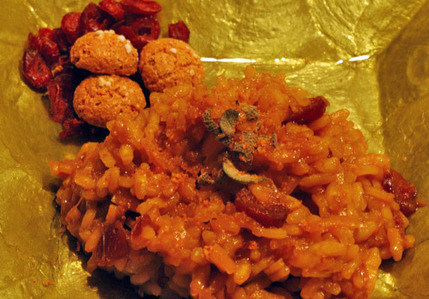 It turns foods a nice bright yellow much like saffron, but is very affordable instead of the highly prized and expensive saffron. It's a staple in many Indian dishes and it's a member of the ginger family, Zingiberaceae. This dish, then, qualifies as Frankenstein's monster because I used an Asian-curry-oriented spice in a traditional Mediterranean and specifically, Italian method of preparation. The flavors of the dish were built around the turmeric and my ingredients were meant to balance or play off the turmeric. It's freaky-Frankenstein-iness is in the usage of turmeric with the method of making risotto. My recipe for working it all together is below. Heat a saucepan on low and add the vegetable stock, keeping it warm throughout the process. Heat a medium heavy-bottomed pan on medium-high, add the butter and olive oil and melt. Add the onion, butternut squash and saute until the onion is light golden. Add the arborio rice, and saute a few minutes more, until the rice kernels turn transluscent. Add the brown sugar, turmeric and ginger. Stir thoroughly to incorporate all spices with the vegetables and rice. Add in one ladleful of vegetable stock, salt, stir, reduce heat to simmer and put a lid on the pot. Let the risotto cook slowly, with lid on and every 5 minutes or so, check to see if the stock has absorbed and if so, add another ladle of the stock. You may not use all of the stock or you may need more. This depends on a variety of stovetop, ambient room temperature and humidity factors. You simply need to watch the risotto and add more stock before it cooks dry, tasting for doneness each time. It's important that you do leave the lid on for it to cook in between additions of stock. Do NOT stand there and stir and manipulate it the whole time. Let the risotto cook covered, undisturbed but just remember to listen for sounds of sizzling (bad) and add stock to keep it moist throughout. You will likely simmer for at least 25-35 minutes. When the risotto is nearly done (moist but still firm and you think you only will add one more ladle and be there) add the dried cranberries and lime juice. Add your final ladle of stock and let simmer to completion, until all the stock is absorbed. Remove from the heat, garnish with the grated amaretti cookies, sage and serve immediately. Poaching fish is such a fantastic way to infuse it with flavor while ensuring moistness and delicacy. I often use this technique when I'm looking for a quick meal that doesn't sacrifice flavor or the sense of "dining" as opposed to "eating". At Scrumptious Street, we definitely like to dine. 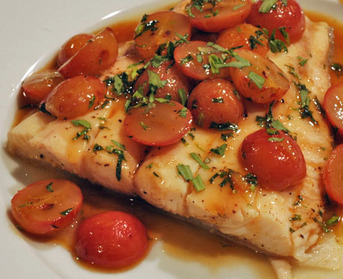 A big winner recently was Halibut Poached in Vin Santo with Red Seedless Grapes and Tarragon. In this recipe, you can really substitute many ideas or liquids, fruits or herbs. The idea is really to combine something sweet and tasty with a little tartness and herbs for depth. I like the way that sweet grapes work with tarragon that is slightly tart and reminiscent of just a hint of licorice (more on the nose than the palate). I must thank my dear friend, an Amazing Massage Therapist, for the inspiration of this recipe. I only wished she had been there with us to share it. She came to visit us in our new home a couple of days before I made the fish. She brought with her a delicious bottle of Felsina, Vin Santo Del Chianti Classico, 2005. This is a very special sweet Italian dessert wine, which since the 14th century has been used as a gift of friendship and hospitality. In bringing a bottle to our new home, she bestowed good wishes and grace upon us with the thoughtful gift. When I brought home some fresh halibut steaks and plump, juicy red seedless grapes, I knew her wine would be the perfect way to infuse the fish with terrific flavor and sweetness. Thanks, my friend, for the inspiration to create such a scrumptious meal. Next time I make this, you will be at the table with us. Add the stock, wine and clementine juice to a medium skillet on the stovetop and bring up to a very gentle simmer, so that the bubbles are just barely moving on the liquid. Season the halibut with salt, pepper and olive oil, rubbing into flesh to distribute evenly. Gently slide the halibut into the simmering liquid. We're using a shallow-poach here, so that the liquid only comes about 2/3 the way up the height of the fish fillet. Cover the pan and let the fish poach about 4 minutes. Flip and cover again, letting the fish poach another 3 minutes or so. You can tell it'd done when the fish is white rather than pink and the flesh can be flaked apart with the tines of a fork. Remove the halibut and set aside, keeping warm. Increase the heat on the sauce to near-boil and reduce the cooking liquids by at least half, for about 10 minutes. When the sauce is thickened and intense, add in the grapes, butter, tarragon and swirl to melt and incorporate into the sauce. Put the halibut on a plate and spoon the sauce over the fish. Sprinkle with additional tarragon and serve immediately. I was recently reminiscing about a Spanish tapas and wine class that my two best friends and I took a couple of years ago at The New School here in NYC. The class was exceptionally high on the fun scale, high on flavor and scrumptiousness and low on instructional value. Nevertheless, it was a great evening and the highlight was when the hard-working dishwasher accidentally threw away the mussel broth. Before the mussels were served and eaten. The instructor gasped, swore like a sailor spluttered, nearly FLIPPED his lid. We all took turns surreptitiously consoling the dishwasher throughout the rest of the evening, ensuring him it truly wasn’t the end of the world. In the class, one of the new discoveries was the fantastic combination of manchego cheese and quince paste (a.k.a. membrillo.) The two are a marriage of epic Spanish proportion (albeit apolitical and non-violent) with a well-balanced sweet-salty-symbiosis. We also had marcona almonds roasted in olive oil and sea salt, which were a wonderfully intense chaser to the manchego and quince morsel. On my way home the other day, I was reliving this special memory and began craving the tastes from that evening. I contemplated what dishes I could create to scratch this particular culinary itch and my “Cauliflower Manchego Gratin with Quince Glaze and Almonds” was born. I didn’t have marcona almonds on hand, so just toasted raw almonds for a decent substitute. Preheat the oven to 400 degrees Farenheit. Heat a very small skillet on the stovetop to medium-high and add the raw almonds. Toast them, tossing and flipping frequently, until the skins begin to turn a deep brown and you smell the almond aroma, about 3-5 minutes. Remove from heat and set aside to cool. In a large skillet, bring 1/2 inch of salted water to a boil. Add the cauliflower, cover and cook over high heat until tender yet firm about 3-4 minutes. Drain the cauliflower in a colander. In a medium saucepan, melt 2 tablespoons of the butter. Add the flour and whisk over moderately high heat for 1 minute. Add the milk and the hazelnut liquid and cook, whisking constantly, until thickened, about 5 minutes. Remove from the heat and whisk in 3/4 cup of the Manchego until melted and smooth. Add the nutmeg, salt and pepper and whisk again. Try to keep the sauce warm, without cooking it further. Also, chop the cooled almonds into relatively fine pieces. Return the large skillet to stovetop on medium-high heat and let any residual water evaporate from the heat. Add the remaining 2 tablespoons of butter in the skillet and melt. Add the onion and cook stirring occasionally, until lightly browned, about 5 minutes. Add the cauliflower and cook until just golden, about 2 minutes. Season with salt and pepper to taste. Transfer the cauliflower to a baking dish and pour the Manchego sauce on top. Stir in the dish to evenly coat the cauliflower with the cheese sauce. Sprinkle the top with the chopped toasted almonds. Bake for 20-25 minutes, or until bubbling and browned on top. While the cauliflower is baking about 5 minutes before it's ready, prepare the quince glaze. Add the quince paste, white wine and water to a small saucepan. Heat very slowly on low heat, whisking the entire time. When glaze is smooth and even, reduce heat as low as possible and whisk occasionally to keep it warm and silky. Remove the cauliflower au gratin from the oven and let cool about 10 minutes. Spoon the quince paste over the top of the dish and serve. 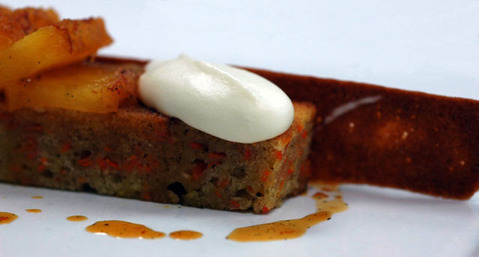 If you had a Rioja on hand, it would be a great wine to drink with this dish. The wonderful Rowena at Rubber Slippers in Italy propsosed a non-meme about the spices we all use. Since my cooking isn't scrumptious without herbs and spices, of course I had to participate. It's really a simple list of questions, but the answers proved more difficult than I anticipated. Most of my spices really are nearly equally used and loved. But, in thinking of the answers, some trends did emerge. Also, I use fresh herbs 98% of the time rather than dried, so while I find things like oregano, basil and tarragon indispensable, they only get used in the dried form in slow-cooking soups and stews. Ginger is another such item; I use it a LOT but always fresh. Only rarely do I use my powdered, ground ginger. Also, let's just say that many varieties of salt and pepper are completely essential and used in nearly every dish so I'll omit them from my official answers. They are "king and queen" of spice usage. 1. Which is the most indispensable spice on your spice rack? Nutmeg. I always use it fresh, grated immediately into the dish or bowl with my microplane. I use it in cooking, baking, sauces, desserts; nearly everything. A little goes a long way, but when necessary, the food just isn't the same without it. 2. Which is the most used? This being determined by a near empty bottle compared to the others. This is tough to pick just one but the three I use most are red pepper flakes, coriander and cumin. 3. Which is the least used? Asafoetida. I use it in Indian dishes and curries but often it goes months without action. I tend to only use it when I'm following specific recipes that call for it and much of my cooking is of my own creation. Somehow when I'm composing on the fly, I never reach for it. 4. Is there a spice or seasoning that you know of or just learned about and would like to add to your collection? I saw this tin of Orissa Long Pepper in my local gourmet shop and would love to try it out. I had never seen this pepper before and its whole appearance is even more unusual. I was thrilled when I got home and googled, finding this site! There are LOADS of wonderful spices here. 5. Are there any health remedies that you practice with the use of spices? A lot of fresh ginger tea, especially when cold and flu season starts up. I boil water, slice fresh ginger and add a bag of ginger tea. I actually leave the skin on, for maximum flavor and nutrients. I also add lemon verbena when it's on hand, or boil lemon verbena leaves as tea. Great mixture.